In this section you will find all our products with shapes or designs of fruits and vegetables. Carrot-shaped buttons are popular both for decorating patchwork or embroidery projects related to the kitchen or the garden, as well as completing Christmas motifs that carry designs of snowmen. In these latter cases, carrots serve as the noses for the snowmen. Strawberry-shaped buttons are another very popular model of decorative buttons in the range of fruits and vegetables. It is strongly related to the summer season and has a cheerful connotation. As the shape of the strawberries is almost round, they can also be used as buttons for children's clothing. We must always remember that attractive buttons should not be placed on garments for children under 3 years of age, since they can be detached and pose a risk of suffocation. Cherry-shaped buttons or embellishments are also appropriate for a touch of spring and summer. Some models with a more compact design can be used in children's garments as well. - They have a rounded shape that allows them to be used as buttons for clothing, as well as decorations in creative projects of patchwork, embroidery, knitting and crochet. - They are a fruit closely linked to the American children's culture, since it is a traditional gift from the students to their teachers, and appears in plenty of designs related to teaching. Apples are also popular as an embroidered patch design for clothing. Use one of these iron-on apples to repair a former year summer garment and give it a new life. They can even be used as a small kneepad in children's pants. Pumpkins have different and attractive shapes and colors, and they are very showy in the decorations made for the kitchen. But they are popular mostly because of the autumn festivities in American culture, namely Halloween and Thanksgiving. There are many models of buttons with the shape of a pumpkin, and this design also appears stamped on other elements, such as decorative pins and more. There are many other buttons, ribbons and stickers with shapes and designs of fruits and vegetables. For example, oranges and lemons, very suitable for patchwork decorations for the kitchen, or to provide a refreshing touch of summer to your designs. Equally summery are the designs with watermelons. There are buttons with the shape of whole or sliced watermelons, with tiny black buttons that can represent watermelon nuggets. Also buttons shaped like bunches of grapes, useful for creative projects related to wine. To use in autumn projects, in addition to the popular pumpkins, you can also use buttons in the form of pinecones or nuts. Finally it should be noted that mix packs are also available that contain several buttons with shapes of fruits and/or vegetables to be uses in different projects, at an excellent price. Product Description: Decorative buttons with shapes of funny farm animals. Perfect for all types of creative projects. Contents: 6 buttons: 1 orange, 1 pear, 1 plum, 1 avocado, 1 apple y 1 peach. Dimensions: between 22 and 32 mm (diameter). Material: Plastic. 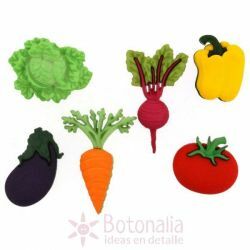 Product Description: Decorative buttons with shapes of vegetables. Perfect for all types of creative projects, particularly for patchwork kitchen projects. Contents: Each pack contains 6 buttons: 1 carrot, 1 yellow pepper, 1 eggplant, 1 tomato, 1 cabbage and 1 raddish. Dimensions: between 20 and 35 mm. Material: Plastic. Product Description: Buttons with the shape watermelon slices.Content: 9 watermelon slices and 5 black watermelon seeds.Material: Plastic.Different sizes between 6 y 18 mm. Product Description: Decorative buttons with the shape of a red apple. Ref. Dress-It-Up: 0754. To be used in needlework, craft, scrapbooking, patchwork and card making projects. Content: 8 buttons of the same model in 2 sizes. Diameter: approx. 15 and 19 mm. Material: Plastic. Product Description: Sticker (patch) with an embroidery of an apple in red.Content: 1 iron-on sticker.Length: 37 mm.Material: Textile. 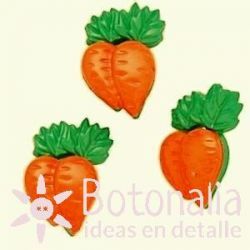 Product description: Decorative button with the shape of a carrot with leaves. Button has a shank. Perfect for crafts and needlework, scrapbooking and card making, patchwork, etc. Content: The price is per unit. Diameter: 24 mm approx. Material: Plastic. Product description: Decorative button with the shape of a small carrot. Button has a shank. Perfect for crafts and needlework, scrapbooking and card making, patchwork, etc. Content: The price is per unit. Diameter: 20 mm approx. Material: Plastic. 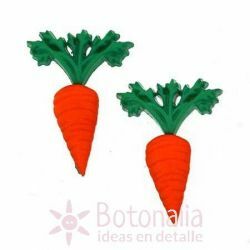 Product Description: Button with the shape of a pair of carrots.Content: The price shown is per unit.Diameter: 22 mm.Material: Plastic. Product Description: Sticker (patch) with an embroidery of a sprig with two cherries.Content: 1 iron-on sticker.Length: 37 mm.Material: Textile. Product Description: Classic round button with a cherry over a background in black. Perfect for crafts and needlework projects. Content: The price shown is per unit. Diameter: 27,5 mm. Material: Plastic.